Appearance: Guitar is a simple brown tabby tom with amber eyes. He has white socks on his front paws(markings), and a light build. He's well muscled, but they will grow with time. Guitar's tail is bobbed. Personality: Guitarchords is a bouncy, happy-go-lucky little tomkit. He's really shy around the she-kits, but is a social butterfly. History: backwritten please! If you need a history: Guitar was born to NPC parents, all happily living in Scorchclan. Other: whovians rock (TARDIS= Time And Relative Dimensions In Space!) 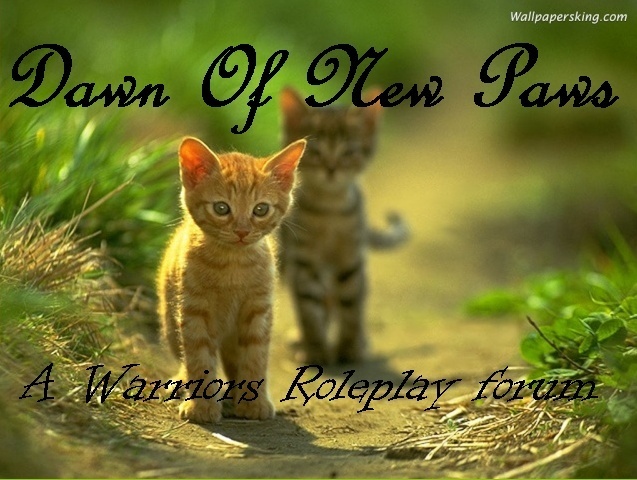 oh, and do you roleplay at WCRPG? Roleplay Sample: Guitarkit smiled. It was going to be a good day! He hoped, anyways. You could never really be sure, after all. "Hey! Good morning, everyone!" The tomkit called, smiling. He padded out of the nursery, all lollipops and rainbows, as always. He didn't really see anyone else around, but surely they weren't all gone. He had always woken up earlier than everyone else. Oh well. Might as well just go back to bed, he decided. Yawning slightly, he curled up into a ball in his nest. Also, I do not roleplay on WCRPG, but I know of it. You may reserve for MCA. This character is now available for adoption. Ember has been deleted. If no one else would like to adopt this character then may I? Only may he not be a MCA if I adopt?